This movie works well as a spectacle depicting 13th-century England and parts of Mongolia and China. As an adventure or character-driven story, however, it’s not so good. This is one of those films in which the angry and stubborn protagonist is told at the beginning what he needs to do to find peace and purpose, spends the next two hours determinedly rejecting that advice, before finally embracing it in the last ten minutes of the picture. Lame! 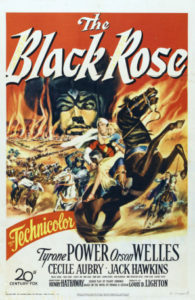 In this case, Walter of Gurnie (Tyrone Power), an illegitimate son of a Saxon lord, is the angry protagonist who’s suffered injustice at the hands of his Norman relatives. Edward II (Michael Rennie)—the King of England, no less—tells Walter he needs to put aside his hatred of the Normans for his own good and that of the realm and its people, but Walter angrily insists on leaving England to seek his fortune in distant lands—in far Cathay, if necessary, which he heard about from his Oxford mentor, Roger Bacon. Cut to central Asia, to which Walter has fast-traveled with his loyal sidekick, English longbowman Tristram Griffen (Jack Hawkins in an early rôle, his cragginess softened by youth). They join a Mongol caravan headed further east to the court of Kublai Khan, bearing tribute of gifts and women to the great conqueror. One of these women is Maryam, a half-English daughter of a captured Crusader, known as “The Black Rose” for her rare beauty. Maryam escapes the harem and joins the Englishmen disguised as a serving boy, and immediately falls in love with Walter, but he thinks having a girl along is a dangerous nuisance and irritably refuses her affections. (Do you see the pattern?) Maryam is played with conviction by the French actress Cécile Aubry, who though age twenty-one at the time of filming really looks like she’s about fourteen (ew! ), which makes Walter delaying his inevitable fall for her something of a relief. The commander of the caravan as it grows into an army is a genuine historical figure, a Mongol general called Bayam of the Hundred Eyes, played by Orson Welles as an engaging rogue. Since Welles was himself an engaging rogue, this isn’t much of a stretch, and though he’s a pleasure to watch here one can see that he isn’t really working very hard. Bayam acts as a counterweight to good King Edward, giving Walter diametrically opposed advice, which actually starts him at last on the road to realizing what a sap he’s been. Along the way there’s a deadly archery contest, several offstage battles, a torture gauntlet, and Walter’s discovery of the Eastern secrets of gunpowder and the magnetic compass. When the gang finally reaches Cathay there’s a long half-hour of clichéd Orientalism before a muddled ending that returns Walter, with Maryam, to England. Alas, we already know how it’s going to end because every single event in the plot has been thoroughly telegraphed. Oh, well, at least it looks good: the movie was shot at scenic locations in England and Morocco (standing in for Asia), plus the desert scenes have camel jokes that are almost funny.